It’s been hot everywhere it seems. Ric and I took it hard here in Rome when the heat hit in mid-June, earlier than “usual” we are told. Hottest June in 231 years said one source. Who knew weather records were kept for more than 200 years? We’ve also been warned that “Rome closes down in August. All of the Italians leave town.” Everyone, it seems, goes to the beach or the mountains to escape the hot city. Now we get it. Three refreshing days in Ortisei (OR-tee-zay) in the Alto Adige region was an amazing, revitalizing getaway. VIew down the main pedestrian-only street in Ortisei. The town is absolutely charming. While heavy on tourist lodgings with more rooms available for tourists than there are residents of the town, Ortisei retains its character and doesn’t come off as phony or overly commercial. Ortisei feels more like Austria or Germany than Italy. One of our Italian colleagues said “It’s not Italy!” The food, the bread, the signs, the architecture all led to a we’re-not-in-Italy-any-more feeling. Given that the region was Austrian until 1919, this is not so terribly surprising. Residents generally speak three languages: German, Italian and Ladin, a regional dialect. While many also speak at least some English, the first words out of their mouths are likely to be German. But respond in Italian or English and you will likely end up in a polyglot conversation! From our balcony we had a view up the valley toward S. Cristina and the Sella Group. We stayed in the very lovely Hotel Garni Walter. It was a short hike up from the central piazza, and oh-so-pretty and serene. La famiglia Demetz has owned and managed the B&B for 43 years and recently renovated the entire place. Each room is outfitted in pine furniture, Tyrolean fabrics, and federbetten (German-style feather comforters) that kept us warm during the cold nights. No A/C required! 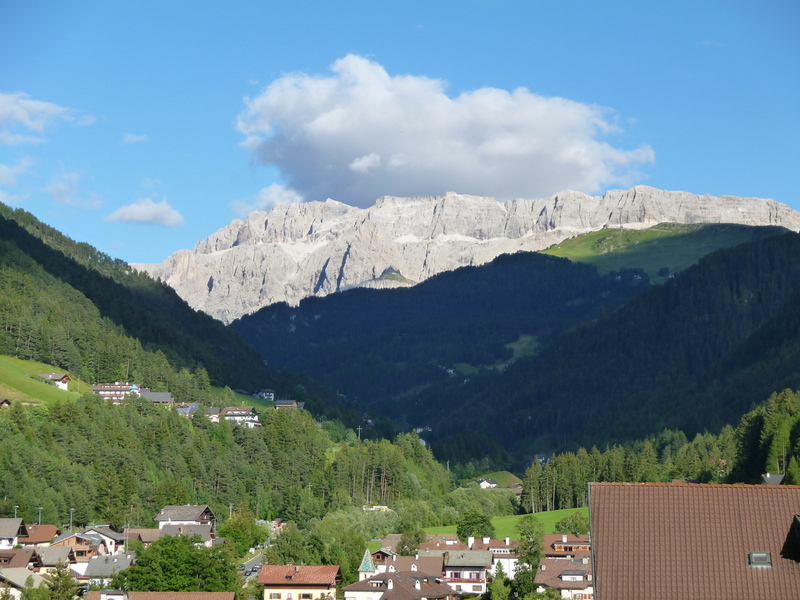 To give you an idea of how refreshing the summers are, Sylvia told us on arrival that it was “warm for here: 24C (75F) degrees.” Ortisei is the first of a string of three villages in the Val Gardena. Only a few minutes apart by car or bus, you can also easily visit S. Cristina and Selva Gardena. All three towns have two names: one Italian and one German. Ortisei is St. Ulrich to the German-speaking population. Each street has two names as well. (Luckily they are clearly marked unlike many in Rome.) 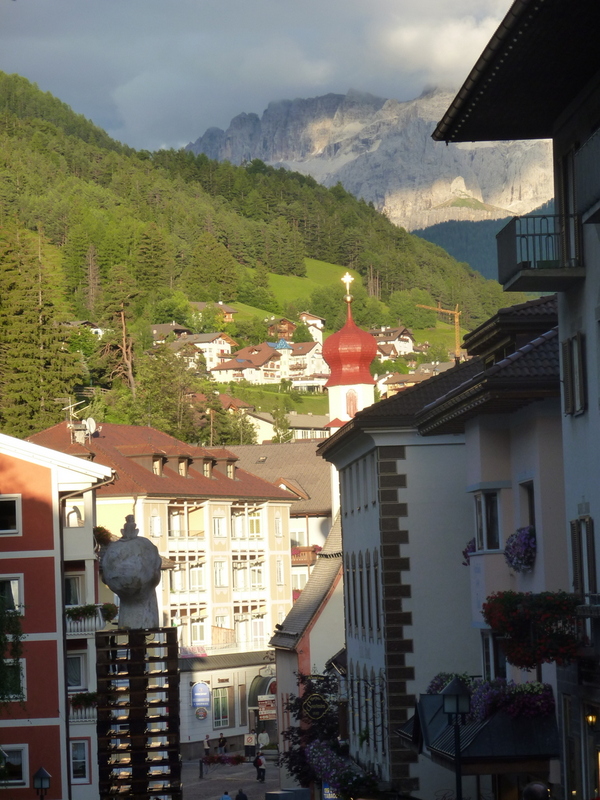 The architecture is Tyrolean, with onion-domed churches throughout the area. 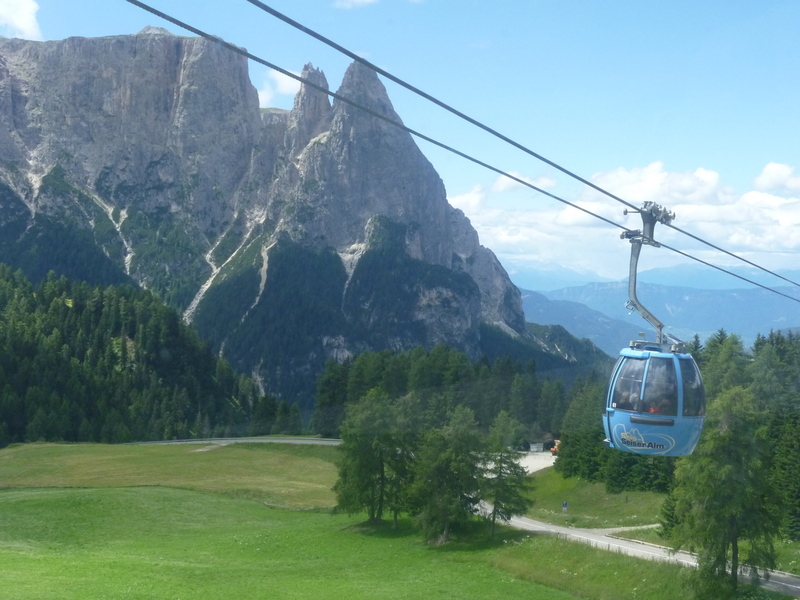 Gondolas or “cabinovia” ferry people up — or down — from the Alpe di Siusi. In the Alpe di Siusi, starting our hike at 44 degrees F, bright sunshine, and a terrain so beautiful it could bring tears to your eyes. 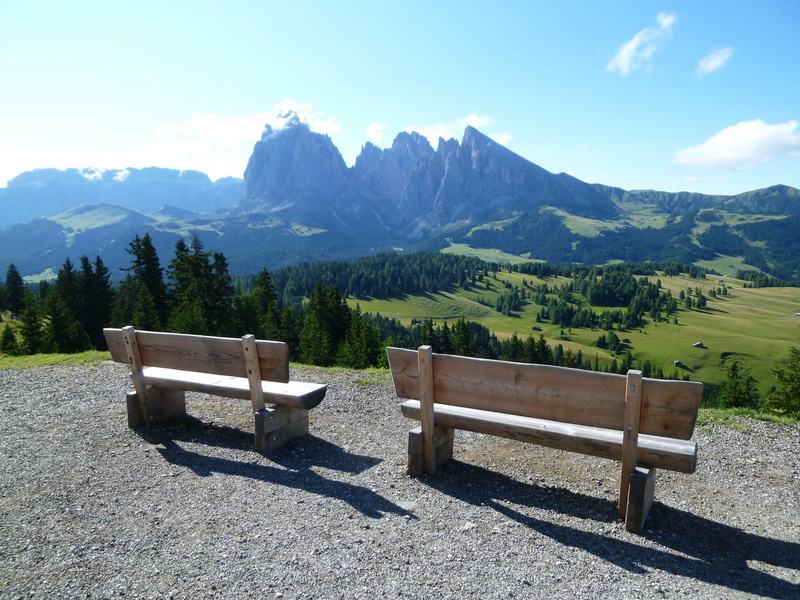 The Val Gardena is a hiker’s paradise. 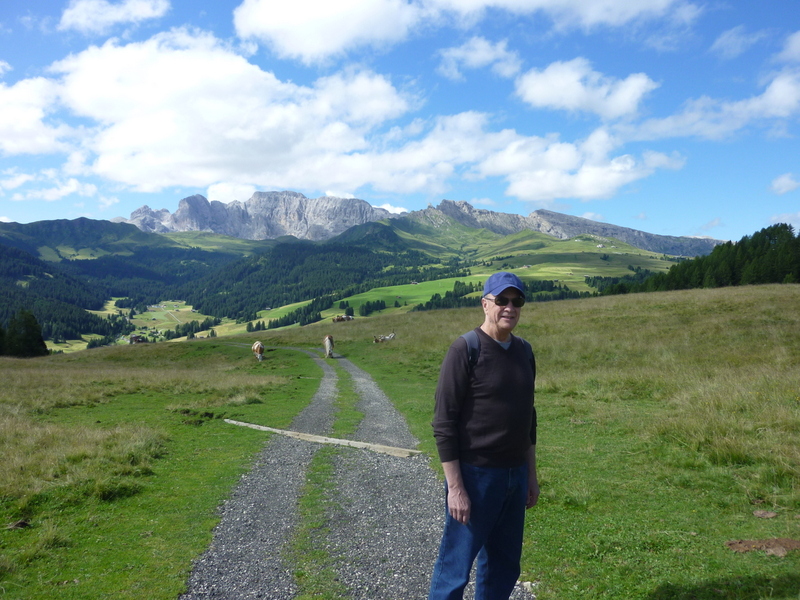 One can hike in the mountains on either side of the Val Gardena, or from town-to-town in the valley. You can hike up to the high meadows or ride cable ways up and hike – or bike – down. 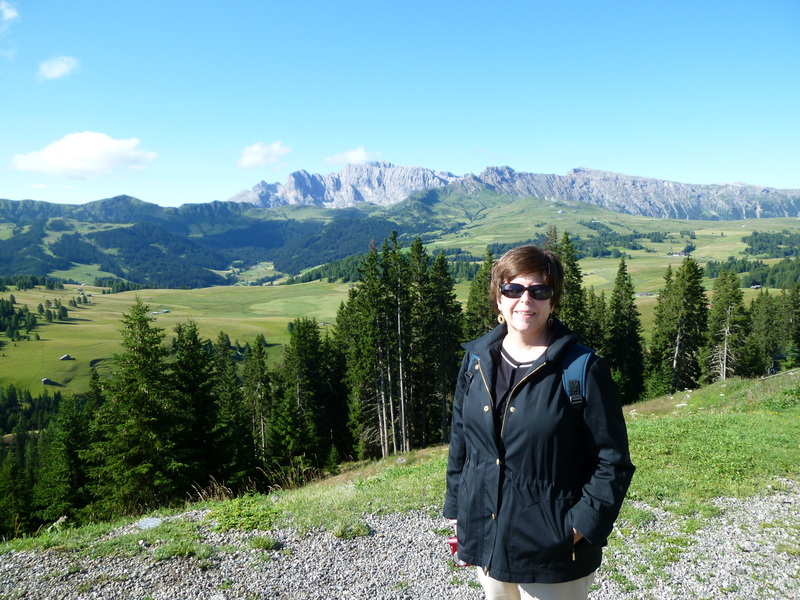 We had a lovely hike in the Alpe di Siusi. Starting out one morning at 09:00 the temperature up on top was a brisk 44F/7C but sunny and clear. The green meadows, wild flowers and soaring peaks of i Dolomiti are achingly beautiful. The peace was disturbed only by the distant ringing of cowbells carried on the light breeze. We set off for Saltria, a “town” at the other end of the meadow from the terminus of our cable way. As is often the case in Italy, the trails are not groomed in the way they are in the Pacific Northwest. Sturdy hiking shoes are a necessity. 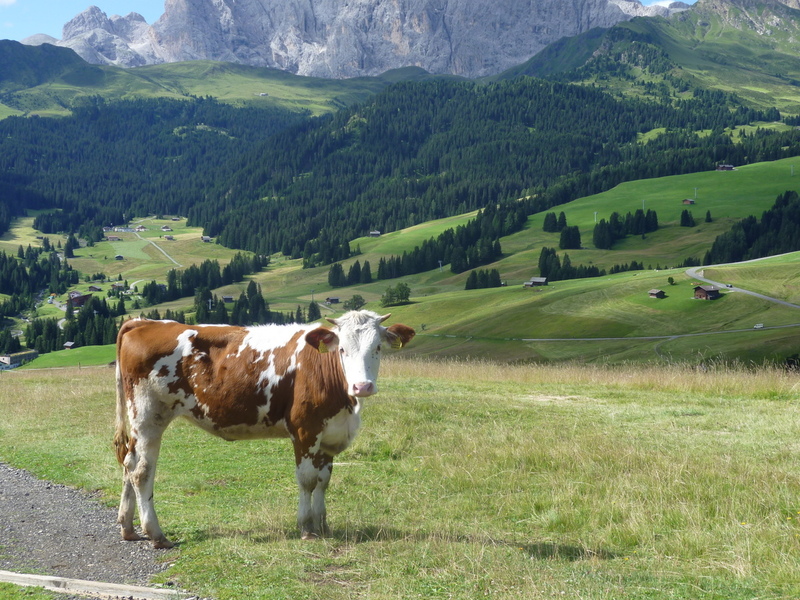 The trails in the Alpe di Siusi are well-signed however, so getting lost is unlikely. Our terrain included a road large enough for a horse-drawn cart, a footpath through a grazing herd, and a forest path much like in Oregon. Ric on the hike to Saltria, through a meadow with grazing animals. Yes, this was the marked path, through the herd. 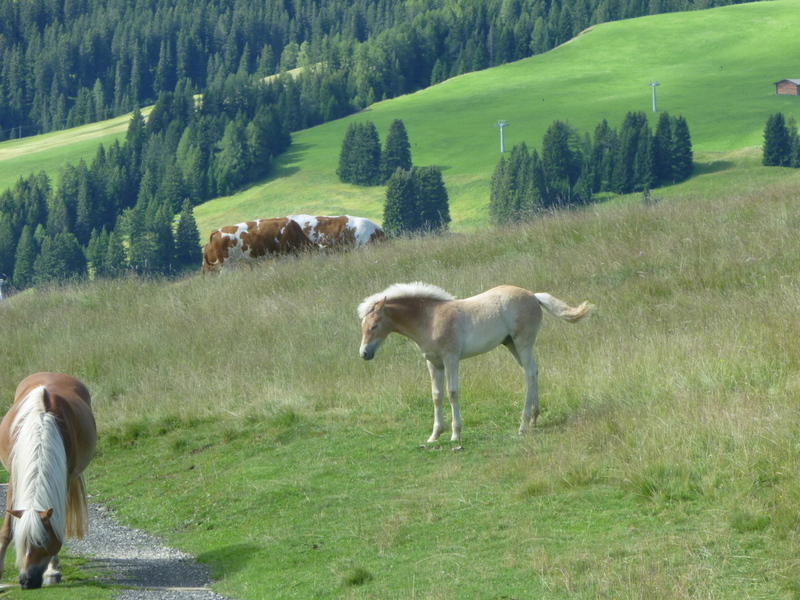 Wildlife in the Alpe di Siusi. Moments earlier, this little guy had been rolling in the grass, thoroughly enjoying the alpine morning. The “town” of Saltria consists primarily of two resort-hotel/spas and a large bus stop. You can take a comfortable bus from Saltria to Compatsch, where there are more resorts, lifts, and hikes. We were quite taken by the opportunity to actually stay in the Alpe di Siusi, and plan on doing so next year. I could go on and on. The food is great, as we have come to expect in Italy. You can have a fine pizza from a forno a legno (wood burning oven), and certainly there is pasta, but also many regional specialties like canaderli (dumplings), Wiener schnitzel, and speck (a type of bacon) is everywhere. We saw – and ate – more potatoes in a weekend than we’ve had in two months in Rome. One of the more unique pasta dishes was spaghetti con cervo, a sauce made with venison. And a vegetarian option of grilled vegetables is served with a round of warm camembert cheese. That’s one dish I plan to try at home. We will likely make this an annual trip. Rates go up significantly in August when Rome empties out, so I think we’ll take our annual cool-down break in July when the area isn’t over-flowing with everyone else escaping the hot cities. We’ll be back next year for certain. I love your blog! I got here by reading your posts on the RS Helpline. I lived in Rome on and off for nine years, and go back at least once a year. Fabulous photos, too! Thanks Zoe! Glad to have you follow our experience. We do so love living here! Absolutely lovely. You write the best travel guide! We have landed in sunny Spain! After a layover day in NYC where we rode a 3000 hp speed boat around Lady Liberty (the boys loved it and so did we), we flew all night to get here. Found a nice veggie restaurant about a mile from our hotel (Europa, Plaza del Sol). Peg’s logistical prowess has been superb and as soon as we get our sleep cycles figured out we’ll be all set. Prado and park time tomorrow, and on to Barcelona on Wed. Fun, fun, fun! Great to hear about your vacation as we have 2 nights in a Refugio up in the Dolomites on the horizon. OK! What did John T say? Newport Beach now, Turkey and Swiss this fall. You will find some achingly beautfiul places there, as well. Miss you! Hi Carolyn! It is high time you came back to Europe! You’d better organize a tour.